Tue, 26 Jul 2011 | Published in I Was There . . .
As I got out of my car Friday night my first thought was “Holy crap it is hot out here.” Sublime with Rome and 311 were the acts of the night. They had the horrible misfortune of playing on the hottest night of the year so far. The fortune however, was that they played at my favorite venue in the tri-state area. Jones Beach Theater is literally on the beach. It is an open amphitheater with views of the water all around you. Walking through the parking lot it was easy to see how excited everyone was. Everyone was sitting by their cars drinking, talking or dancing. Every car played a different song but all from either 311 or Sublime. When you entered the concert area the first thing you saw was the massive Ford setup that included the new 2012 Ford Focus and everything surrounding it. To be very honest, my friend almost walked away with a new lease. It’s hard to sell me on something but there was so much I liked. Sony actually has their name in the car because all the audio equipment is theirs. The remote start is something my 2000 Mazda certainly does not have. The best part above all is the auto parking. The guy showing us the car saw we were skeptics and promised he had used it earlier that day and loved it. After establishing we were city people he said the 2012 Ford Focus can park itself with only 2 inches left on each side. Before leaving we entered tickets for a serious money raffle and walked away with lots of Ford Focus freebies. After that serious detour to gawk at cars we took our seats. There were two different DJ’s who spun tunes before the bigger acts. 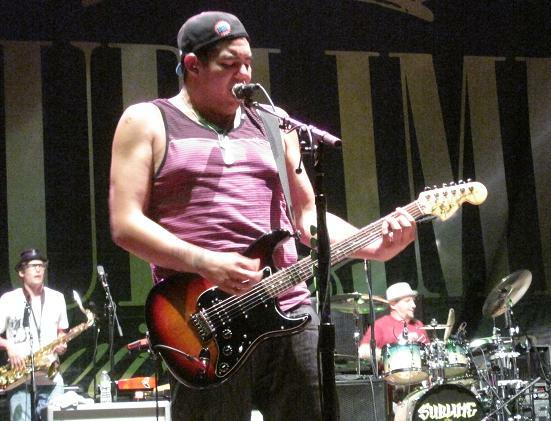 Sublime with Rome was a major opening act. Everyone was standing up and even though the sun was still blazing, everyone danced to the beat. Sublime songs are everlasting, people of all different ages were rocking out. Most people don’t realize it but when you are in front of your favorite band, hearing them play your favorite song, you get a gooey look on your face. It was easy to see an audience full of grinning faces. The last and most memorable song they played was “Santeria.” There was not a single person present who was not either singing or mouthing the words along. After they left the stage audience members screamed for more and chanted for the band to come back. After another DJ interlude, 311 hit the stage just as the sun set. The energy and vibe were electric. No one sat down, not once. As the sun set it became cooler and people relaxed. High energy songs like “Jackpot” had people jumping up and down while screaming. Songs like “Come Original” and “Amber” mellowed to crowd into an easy beat. “Sunset in July” was the perfect song of the evening. It spoke to everyone there and made the entire concert feel intimate. After an excellent evening I went home tired and with a little less hearing, which is the exact feeling you should leave a concert with.